Josh Swindle sporting the paramobile golf cart. Kiawah resident Deborah A. Perelmuter graduated from Wharton with a B.Sc. in 1983, and earned her MBA from New York University’s Stern School of Business in 1991. She is currently on leave from her position as Senior Vice President of Research and Statistics with the Federal Reserve Bank of New York after being diagnosed with Multiple Sclerosis in 1996. MS took its time eroding her ability to participate in the joy of sports, effectively eliminating her golf game about six or seven years ago. That was before the fall of 2018, when the Kiawah Island Golf Resort acquired a Paramobile. 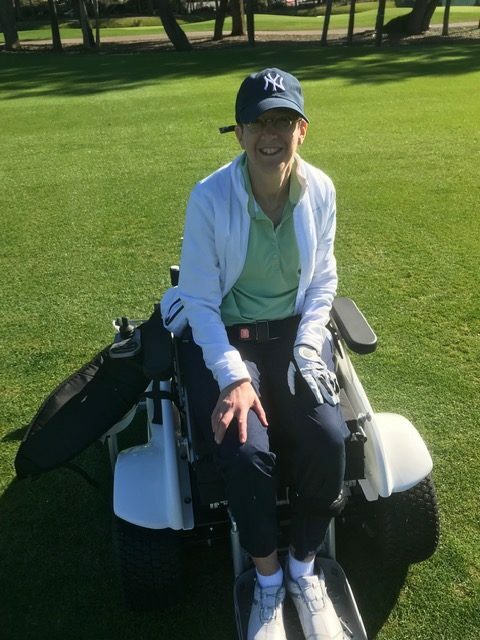 Debby Perelmuter is back on the golf course using the paramobile cart. (Photo by Jim Perelmuter). The device was invented by California-based golf coach Anthony Netto. He married the idea of a standing frame to a motorized wheelchair with the help of engineering company ESORO, and medical device manufacturer Ottobock. The Paramobile goes from sitting position to standing position in a matter of seconds. Consequently, it’s not only possible, but also practical for people like Perelmuter to do any number of things, including a round of golf. “You can play with other people without holding them up. I have to learn to manage my swing [because of the device] but this is such a great, unique vehicle, and a great accommodation for those who don’t have any balance, or strength in their legs. They can actually play sociable golf, in a group, at a walking or even running pace, and participate in conversations at eye level. It’s fantastic, so I was really excited to discover they had this program. “[KIGR] has been really accommodating to allow me to use it, and I think they want to make it accessible to more people. So I think Kiawah being one of the first to have a Paramobile is great. There are probably three or four different types of this vehicle, but none are as flexible as this one. It makes the golf game as natural as it can be. It’s a big step above the other devices I’ve tried that haven’t really worked out. The person who invented it really thought of everything. You can use it during fishing, walking, going to the beach… You can stand up and talk to people. You don’t feel like you’re part of the conversation when people are talking above you… and to be able to stand up and to do things like that is just amazing,” said Perelmuter. “I’m going to try to start a chapter up in Pennsylvania where I live in the summertime so I can be a beneficiary, but more importantly, so I can raise consciousness, and get people who would ordinarily be unable to play, back to the game. “Kiawah and KIGR are unique and the kinds of things that they can do for the people who live here is great. I consider myself very fortunate to be able to be a part of those, and to use it as a resident of the island. I’m sure they would love to let people who are visiting use it. I think it’ll be a real boon for this resort and make it that much more outstanding,” Perelmuter said. The “program” Perelmuter referred to is a product of the Stand Up and Play foundation started by Paramobile inventor Anthony Netto. The Foundation is working hand-in-glove with PGA America as a part of PGA Reach, designed to encourage diversity and inclusion. A veteran-centric division of PGA Reach is the PGA – HOPE program. 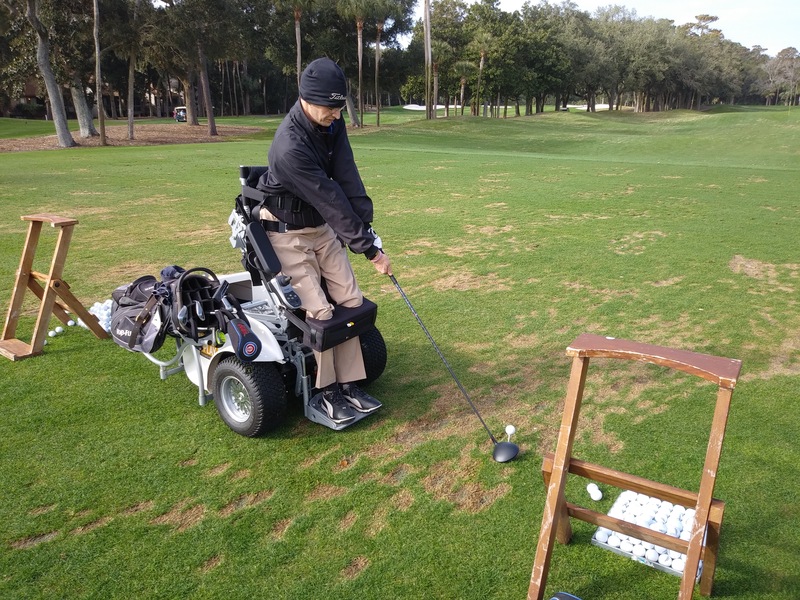 “PGA HOPE Carolinas (Helping Our Patriots Everywhere) is an adaptive golf program offered by our PGA Professionals as a rehabilitation tool to improve our veterans’ quality of life by enhancing their mental, social, physical, and emotional well-being. We serve our veterans at eleven locations in North and South Carolina with an emphasis on helping those with physical and emotional disabilities that would most benefit from our initiative,” reads the PGA HOPE Carolinas website. “PGA HOPE is free for all active duty military or veteran members, and is funded by the PGA of America under a program labeled PGA Reach. It’s an eight week series on Kiawah we run winter and summer. [That schedule] kind of spells the rest of the PGA HOPE chapters in Charleston (Wescott, Daniel’s Island and Stono Ferry), that run spring and fall. So we’ve created a year round outlet. 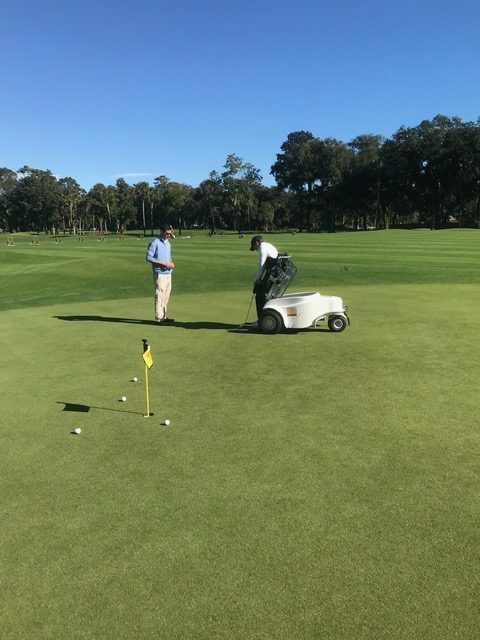 Most of the guys here have PTSD, and this is a way for them to reincorporate themselves into civilian life,” said Josh Wagaman, Head Golf Pro at Kiawah’s Cougar Point Golf Course. “At the beginning of the program, a lot of these guys weren’t comfortable standing here in a group or having a conversation. They weren’t comfortable being this close to people. By the end of the program you could see them begin to develop friendships, and were more comfortable being around people. It’s just awesome to see the program work. “There are six Kiawah Island pros that teach with us on a weekly basis. There’s a national PGA Reach Cup every year comprised of one team from each of 41 PGA sections. PGA Reach Cup is held in the same city as the PGA Championship. The qualifier was in Pinehurst this year. We have eleven PGA HOPE chapters in the North and South Carolina Sections. The Kiawah team actually tied Wescott in match play but lost the scorecard playoff… so the Wescott team will go to New York this year,” concluded Wagaman. Each PGA Reach team is made up of 4 veterans and one pro, and the 2018 group from Kiawah was captioned by Wagaman. Josh Swindle is one of 20 who benefit from the program at Cougar, and he was also part of the team to visit Pinehurst. Swindle was injured in a firefighting accident, and was previously a member of the National Guard. The pictures of Swindle tell their own story, but seeing him drive a ball down the middle from the Paramobile is nothing short of inspiring. For more information contact the Cougar Point Club House at 843.266.4020, visit standupandplayfoundation. org, or Carolinas.pga.com/pga-HOPE.